Earlier this summer my mom and I got to cross of a bucket list item (well for me anyway). 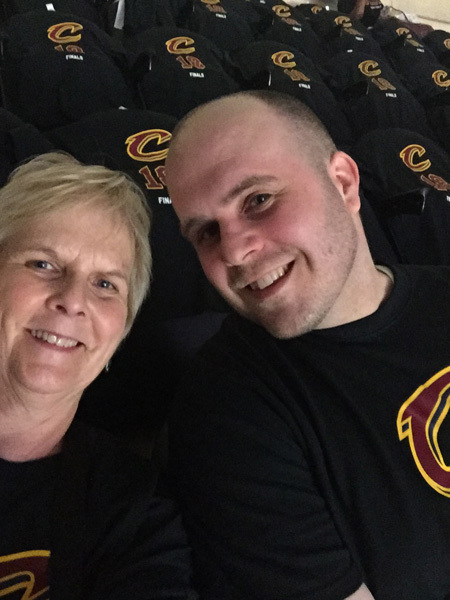 We attended game 4 of the 2018 NBA finals in Cleveland! Here’s a shot of us while we waited for tipoff. We were decked out in our “free” shirts in order to Black out the Q. It was definitely blacked out! We also got some free knockoffs of the famous Terrible Towel. 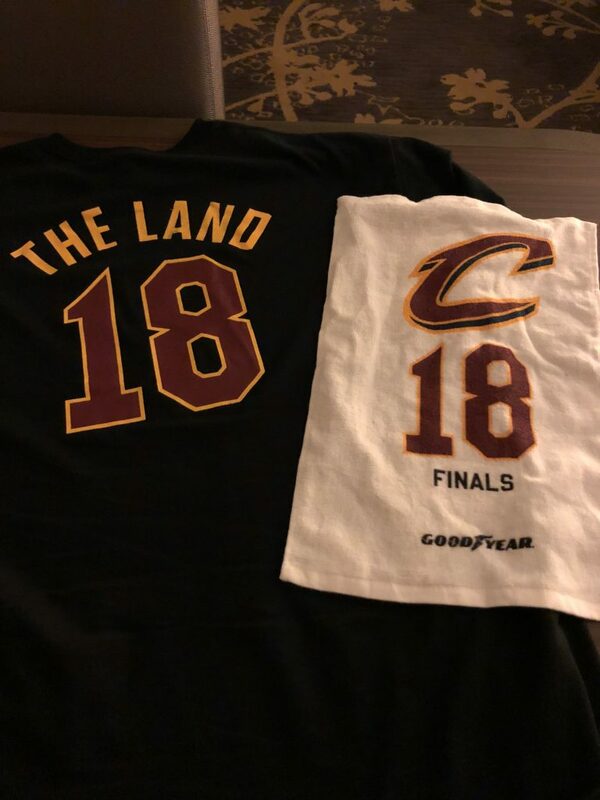 Unfortunately, blacking out the Q and waving our towels didn’t do much to help out the Cavs. It was a rough game, to put it lightly. I had hoped maybe the Cavs could at least squeak out one win at home, but that was not to be. LeBron didn’t really look great the whole game. Maybe he was already checked out mentally. He had given so much to that city, to that team, over the years, and maybe he knew his time was up. Hard to say, only he really knows for certain. It seemed to be the consensus among the people that we walked around town with that something was definitely “off”. I noticed something interesting in the box score. 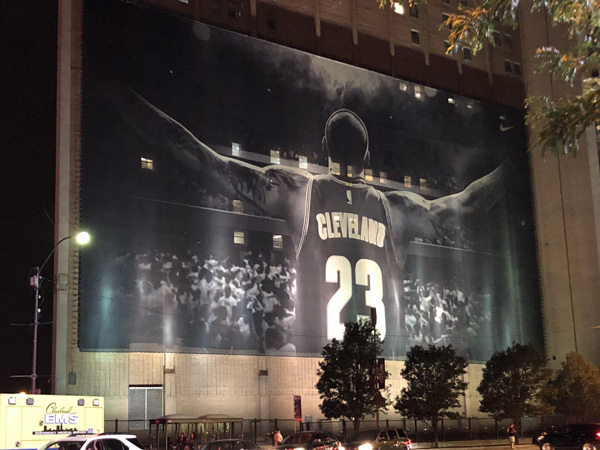 I don’t know if it was intentional on James’ part or not, but he ended up with 23 points – the number he wore for Cleveland during his two stints there. Like I said perhaps it was just a coincidence, perhaps not. Turns out we got to watch some history that night. The Warriors completed their 4-game sweep of the Cavs, further adding to their dynasty in the making. We also got to watch James’ last gave as a Cav. Perhaps. I’ve read some rumors that he might come back for a final go around before he retires. Who knows. If he does, I’ll definitely be making at least one more road trip out. I’m glad I got a shot of THE billboard before we left. Especially seeing as how it’s not there anymore. Yes, we were witnesses, like the ad campaign said. I just wish what we had witnessed had turned out in the Cavs favor. It was a great trip with mom. We stayed right downtown which made getting to the arena not TOO much of a hassle. I even think we saw one of the ABC announcers at our hotel, which was cool too. Thanks again, Mom, for such a great experience. I’ll never forget it! Thanks to you Jared for asking me to go! It was truly a fun outing and I’ll remember it fondly for a long time😊 A CA trip would not be probable, but not beyond the realm of possibility 😉 Love you son!